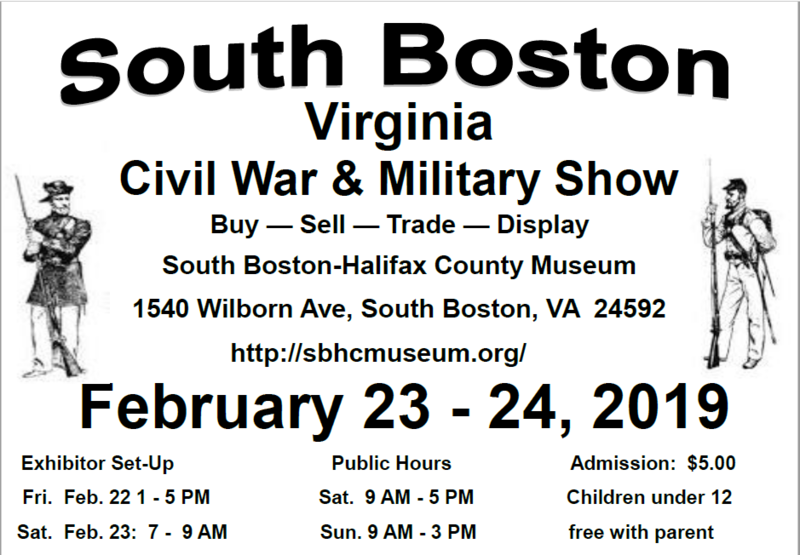 Our annual South Boston Civil War and Militaria show is back once again! Collectors from all over the Commonwealth of Virginia and the State of North Carolina will be able to buy, sell and trade cherished Vintage Militaria, Civil War Memorabilia, and a variety of Collector Arms at the South Boston – Halifax County Museum. Last year, our pilot event gathered an attendance of more than 180 people in 2 days. This year, both new and returning vendors will make this event better than last year. Visitor Admission to this event is $5 per person. Children under 12 are free with a parent. Anyone who wishes to participate as a dealer is invited to click this link more information about the event and how to register a booth. Rules and restriction apply.